PICKLEBALL IS THE FASTEST GROWING SPORT IN THE U.S. AND POPULAR WITH SENIORS, OFFERING A GOOD WORKOUT YEAR ROUND WITH LOW-IMPACT ON JOINTS. The Caseys, a senior couple from Rochester, NY, tried the game this summer. Like many others, including this writer, they learned while on vacation and now play at home. The game is a mix of tennis, ping pong and badminton. The racquet is the size of a ping pong racquet but has a longer handle; the ball is whiffle-like and the court is about half the size of a tennis court or a doubles badminton court. In the mid-sixties Congressman Joel Pritchard—who named the game after his dog, Pickles—and pals created the game in Washington State by piecing together old sports equipment to entertain their kids. Today, 2.5 million people in the US play and 75% of the core players are age 55 plus, according to the 27,000 member association, USA Pickleball (USAPA). The sport has a language of its own. If your partner yells, get out of the “kitchen,” she’s referring to the no-volley zone adjacent to the net (not where food is cooked) to prevent players from slamming the ball. Watch those backhand “dinks.” You can get pickleball elbow. New Yorker Michelle Foster, 68, who winters in Florida, plays daily and she is building a house with a pickleball court. “It keeps me fit and healthy,” she says. “You don’t wear yourself out like in tennis. And it’s easy to learn at a basic level. There’s a lot of joy and laughter associated with the game.” Foster explains that like many tennis players she struggled at first because in the zone by the net you play a soft game. “You have to get out of your comfort zone and override muscle memory,” she explains. New York City, however, is lagging behind the rest of the country when it comes to dedicated pickleball courts. Players who learned the sport on vacation find they must go to Hoboken, Livingston and other New Jersey spots, Fairfield, Nassau or Suffolk counties to pick up games or find courts. Part of the shortage of courts in the city is the high price of real estate although around the country, many resorts are converting existing tennis courts to pickleball courts to accommodate the popular growing sport. Kara McKinney thinks the shortage of courts in the city is “about spreading the passion” for pickleball. 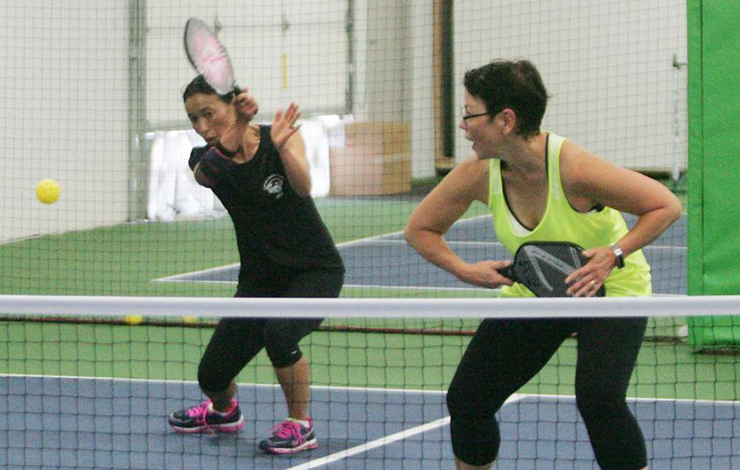 In many cities, pickleball has begun as a court-sharing sport. William Hanft, who plays both tennis and pickleball in the city, says, “There is a need to grow awareness that will force “the city” to create courts be they shared courts with basketball and tennis or eventually dedicated courts. One enthusiast even travels from Brooklyn to Hoboken for a regular 6 am game. Enthusiastic Picklers everywhere are eager to grow the sport. “The biggest downside,” said McKinney is “not enough dedicated pickleball courts.” As more tennis centers embrace the sport we’ll likely see a change. Aficionados are waiting. Robert Moses Playground, Outdoor Courts, 41st Street and 1st Ave. The West Side YMCA, Indoor Courts, 5 West 63rd Street, 212-912-2600. Coming January 2018: Pickleball on Tues & Thurs. To read the published article on NYCitywoman.com, click here.